Habitat. 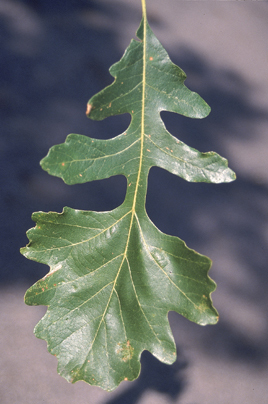 Bur Oak tolerate a wide range of soils but prefers moist soils. 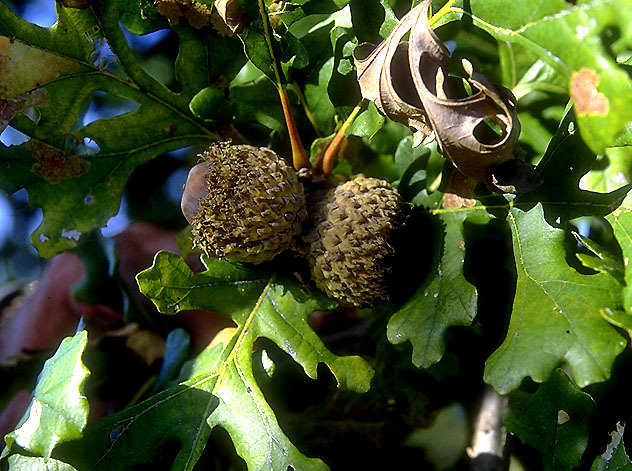 Well-adapted to alkaline soils, poor drainage, and high clay content, Bur Oak is also very drought-tolerant. Bur Oak grows best in full sun. Bur Oak will adapt to various soils where other Oaks sometimes fail but is difficult to transplant from well-drained soil due to the tap root. Leaves. 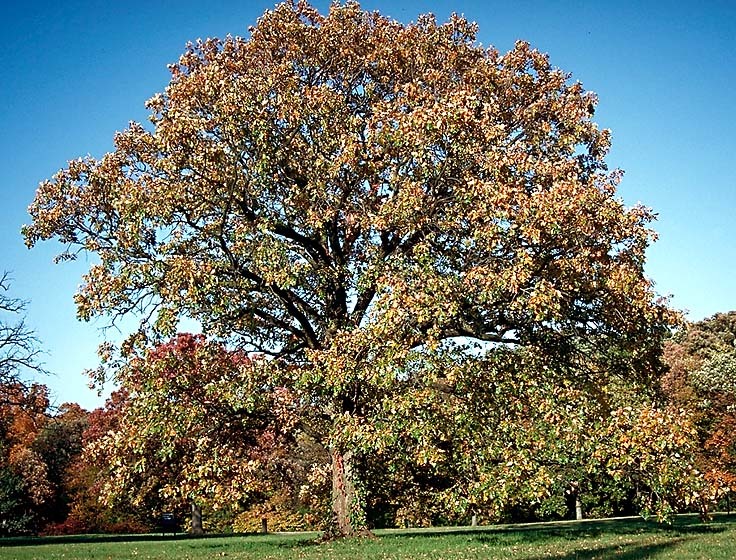 Since it is in the white oak family the bur oak leaves are 6-12" long, oval, 5 to 7 lobed. The upper surface is lustrous, dark green; lining silvery pubescent. Deeply lobed in the middle. Flowers. Flowers in May, staminate in profuse, clustering slender, hairy catkins 4-6" long with opening leaves. Fruit. Bur oak fruit ripens autumn of first year. Acorns are 1/2 to 2 inches long, fuzzy, in deep brown hairy cups, annually, kernels are white & sweet. Largest of the oak acorns. Winter Buds. Terminal bud is 1/8th inch long, reddish brown and oval hairy and blunt. Bark. The bark is gray-brown, deeply fissured, shaggy; branches ridged, shedding plates of bark; twigs stout, pubescent, and winged with corky ridges. Wood. The wood of a bur oak is brown, closely grained, heavy, hard, tough and durable with conspicuous pith rays, used as the highest grade of white oak in the lumber trade. Excellent lumber tree. Pests. Many caterpillars feed on Bur Oak but only the gypsy moth is a serious pest. Cottony maple scale is occasionally found on bur oaks These insects overwinter on the branches as immature females. Distribution. They are native from Nova Scotia to Montana; south to Pennsylvania, Tennessee, and Texas. Other. Bur Oak also called Mossy Cup Oak has an average growth rate for an Oak, maturing with a broad round crown, leaves turning an attractive copper-yellow in fall. Maximum height is 165'. Bur Oaks can be difficult to transplant because of the deep taproot. The tap root dominates the root system on young trees growing in well drained soil. If you are planning to buy Bur Oaks for landscape sales we highly recommend our root growing bags for easy transplanting as the Bur Oak tap root can not penetrate the bag..
We also have: Burr English Oak, English Oak, Willow Oak, Chestnut Oak, Columnar English Oak, Shumard Oak. White Oak, Swamp White Oak, Pin Oak, Northern Red Oak, Heritage Oak, Regal Prince Oak, Rocky Mountain White Oak, Oregon White Oak, Burr gambel Oak, Scarlet Oak, Northern Pin Oak, Bur Oak, Chinkapin Oak. To order Bur oak seedlings by PHONE: We're glad to take your order by phone @ 231-544-6769. Phone orders can be charged to VISA, American Express or MasterCard accounts.